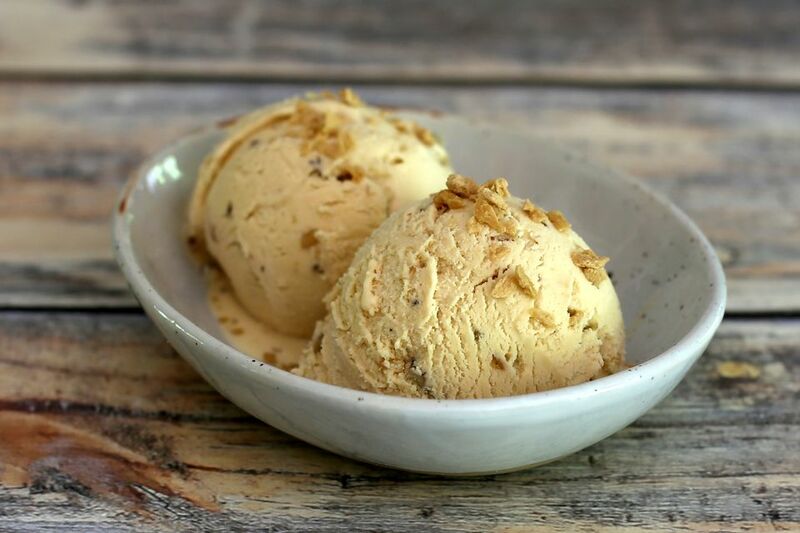 The walnuts do add a nice crunch and nuttiness to this recipe, but it is the pure maple syrup that is clearly the star of this creamy maple walnut ice cream. Along with the chopped walnuts, you can add maple flakes to the ice cream, giving it a bit of extra crunch and even more maple flavor. This is a fantastic ice cream to serve with an apple crisp, cobbler, or pie, or enjoy it with a drizzling of maple syrup. You can also use more maple flakes or walnuts as a topping as well. Put the maple syrup in a heavy medium saucepan and place it over medium-high heat. Bring to a boil, reduce the heat to medium, and continue boiling for about 3 to 4 minutes, or until it has reduced to approximately 3/4 cup. Stir in the heavy cream and light cream along with a dash of salt. Bring the mixture to a boil and remove it from the heat. In a medium bowl, whisk the eggs until well blended. While whisking briskly, add about one-third to half of the hot milk and syrup mixture in a slow, steady stream. Add the egg mixture back into the saucepan mixture and whisk to blend. Place the saucepan over low heat and continue cooking, stirring or whisking constantly, until the mixture is quite hot. Do not let the mixture boil. If you have an instant-read thermometer, look for a temperature of about 180 F. (The minimum safe temperature for egg dishes is 160 F.) The mixture will be slightly thickened and hot. Place a fine-mesh sieve over a bowl. Pour the mixture through the sieve into the bowl. Cover the bowl and refrigerate the mixture for 3 to 4 hours, or until it is thoroughly chilled. Freeze the custard in an ice cream machine (follow the manufacturer's directions for your specific brand) until frozen but still soft. With motor running, add the chopped walnuts and maple flakes, if using. Continue churning until the ice cream is frozen. Transfer the ice cream to a container. Cover the container tightly and freeze until solid. Serve topped with additional maple flakes and/or chopped walnuts. The maple syrup grading system is divided into four grades—Grade A Golden Color and Delicate Taste, Grade A Amber Color and Rich Taste, Grade A Dark Color and Robust Taste, and Processing grade. The Grade A Dark Color and Robust Taste is equivalent to the grade formerly known as Grade B. This grade has a somewhat stronger flavor so it is preferred in this recipe. If you prefer subtle flavor, you can choose the Golden or Amber Color. For best results, use a sharp chef's knife to chop the walnuts. To produce added depth of flavor, toast the walnuts. To toast the chopped walnuts, spread them out in a dry frying pan over medium heat. Cook, stirring and turning constantly until the nuts are lightly browned and aromatic. Remove immediately to a plate to cool. Turn this recipe into a maple pecan ice cream by swapping out the walnuts with chopped pecans. Maple flakes are a specialty item, but you can find them at both Whole Foods and Amazon. Whole Foods sells small jars of maple flakes, and Amazon.com has organic maple flakes (which are much less expensive) in 1-pound bags. They're great on cereal, and can also be used in these maple shortbread cookies.